JAGUAR LAND ROVER is the UK’s largest premium automotive manufacturing business. The company is built around two iconic, globally-recognized brands. LAND ROVER is the market leader in luxury sports utility vehicles; JAGUAR is renowned for building sports cars and saloons that epitomize performance and seductive design. Over the past five years, JAGUAR LAND ROVER has doubled the workforce to 36,600 employees worldwide. In 2016, JAGUAR LAND ROVER increased their production volume by 20% reaching 585 000 vehicles. 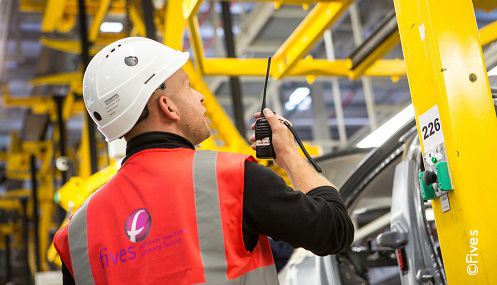 JAGUAR LAND ROVER chose Fives and its Automation teams for the revamping of the current trim & final assembly line in Halewood (Liverpool), UK. This production line was initially delivered by Fives in 2001 and will be refurbished while ensuring the production of the current successful models, Evoque, Evoque Cabriolet & Discovery Sport. A new platform called L551 will be introduced in 2019 / 2020 to produce Hybrid derivatives as well as the next generation of the Evoque model. The main production line will also be extended to create brand new powertrain and decking areas thus as dedicated areas for hybrid & electric derivatives . Fives has been awarded several packages for this extension: 322 off assembly body carriers & toolings will be replaced by new ones. The main 6’ Chain tri rail conveyor system will be extended with a new dedicated loop for the powertrain area. The door line will be extended too according to the main line requirement. A brand new skillet assembly line will be developed by Fives for the Front / Rear Axle Preparation and a unique slave tooling station with ASRS automatic robotic configuration will be provided. Thus, as this is a brownfield project, all the works will be implemented during shutdown periods only to maintain a full 3-shift production. Project is due to be completed by Easter 2018 with a job 1 milestone in Summer 2018.